Suzanne's Tribe: 50 Shades of Pray Blog Hop! Friday free-for-all is a shout out for a blog hop! I know, I know, we're all mega-busy peeps, and even more so at this time of year. But it's because of that I think everyone - yes even you JoJo ;) - should join in with this one! The idea is to take a few minutes and reflect on what was 2013 and looking forward to 2014. 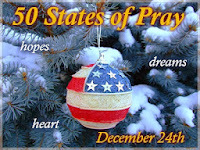 Thanks so much for posting and supporting the 50 States of Pray event. Done a missive, seeing I am in OU essay mode, couldn't help myself!! Great to meet you, thanks to your stopping by my blog, which is thanks to Mark's wonderful hop.